…If you’re like me, and you are, you love that early look of “The Flintstones.” Like the first couple seasons. Also, if you’re like me, you’ve probably hated the last thirty-five years or so of Post Fruity and Cocoa Pebbles commercials, even though you’ve probably never really spent much time thinking about it. But trust me, you hated them. 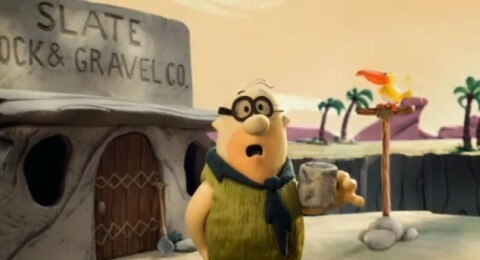 However, I don’t include in that these amazing stop-motion commercials that aired a few years ago. Some scenes really look like first season episodes come to life. Here’s a compilation of five of them on YouTube. Or check out these screen caps, if you don’t want to watch the actual commercials though why the hell wouldn’t you? Look at that! 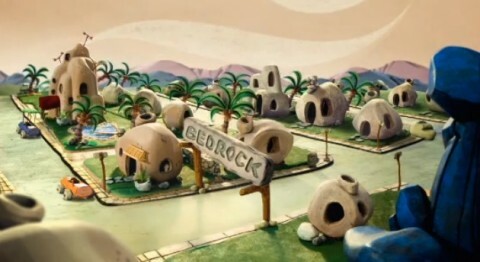 They nailed that early look of Bedrock and you know what the key is, in addition to the rounded houses and the nearly sparse, uncomplicated layout? The color of the sky! Watch pretty much any episode of the original series, even into its later seasons, and the sky was almost never blue, but rather this light yellowish ochre color. 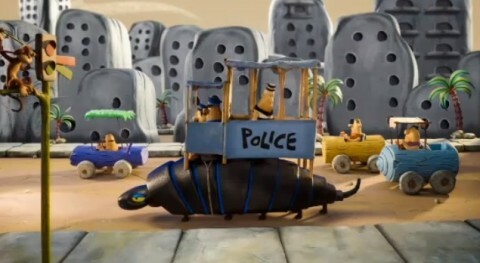 Sure, this version of Fred’s boss wasn’t really in those early seasons, but here Slate looks great, you’ll agree! Okay, here we have a blue sky, but that can be forgiven because of everything else in the shot. The dino-crane on the right is as much as a tribute to the one Fred worked in the show as it is to that early Marx battery-operated toy that I’m hoping you’ll find on eBay and buy me for my birthday. I’ve wanted it ever since I was at an age when it would have been normal to want a child’s toy and and not sad and disturbing as it is at my age now. Ha! They even got the Bedrock cityscape exactly right. And the paddy wagon looked like it scurried right out of “The Swimming Pool” with a xylophone accompaniment for each of its ten feet. Alas, Fred and Barney are, eh, the least interesting elements of the commercials and Fred seems to be based on the design they used for the mid-90s productions. I guess Post didn’t want to push the envelope too far and have the characters match the rest of the elements in the commercials. Interesting, also – it’s a regular sausage-saurus party in these spots. There’s not a single female character in any of them! 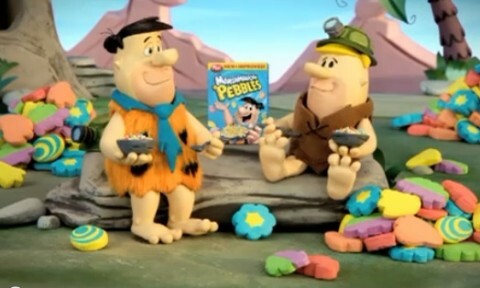 While Wilma and Betty have rarely appeared in the Post Pebbles commercials (due to licensing?) that wouldn’t have prevented some generic Bedrock ladies in the backgrounds of the new ads. Don’t get me wrong! These commercials are Yabba Dabba Delightful! And remember, you read about them here first, almost three years after they debuted and probably long after they’ve stopped airing. Unless they covered ’em over on Cartoon Brew and if they did, let me guess, it was framed as one of the editors’ trademark cranky complaints. Kiddin’! I love them guys! Posted by Ted on January 29, 2013, 6:00 AM.